Villa Elo is a bungalow style property in a great position only a few minutes' walk from Praia D'Oura's famous Strip. It has a never-ending choice of shops, bars, eateries and nightlife leading down to the expansive golden, sandy beach. This 3 bedroom villa has homely interiors plus a private pool and lawned garden - all you need for a relaxing holiday. Pool heating, WiFi and air conditioning/heating in the bedrooms are included. The location is simply ideal with all the facilities of Praia D'Oura within walking distance. Great for a lively holiday! The private swimming pool takes pride of place with plenty of space around it for relaxing on one of the sun loungers, whilst enjoying a cool drink. There are lawns on two sides of the villa plus some trees, palms and attractive plants. The covered terrace has built-in seating, a dining table and chairs, and to one side is the brick BBQ so you'll have all you need for dining alfresco in true Portuguese style. There is parking on a private cobbled driveway to the side of the villa. The front door opens into a small hallway. There is a large, L-shaped open plan lounge/dining room with a high, wooden ceiling and beautifully tiled floor. The dining table and chairs is to one end, whilst to the other there's comfortable seating, a flat screen TV and feature fireplace. The lounge has direct access to the open courtyard Villa Elo is built around, and a second set of doors open onto the covered dining terrace outside. The kitchen is compact and well equipped with striking brown and beige, glass-fronted units and marble worktops. A convenient serving hatch to the dining area helps make meal times easier. There are 2 double bedrooms, one with an en suite bathroom and the other with an en suite shower room. Completing the sleeping arrangements is 1 twin bedroom with an en suite shower room. All bedrooms have fitted wardrobes and access to the pool terrace or garden. There is 1 separate shower room. This villa has applied for a licence and the submission number is 238/2008 ALOC. The licence number will follow. This villa is situated in the bustling resort of Praia D'Oura with the cafes, bars, shops, restaurants and nightlife along the Strip within a few minutes' walk. It leads down to the beautiful Golden beach, also lined with bars and cafes. You'll have all you need for a lively holiday on your doorstep, although if you wish to explore further Albufeira with a host of facilities is just 5 minutes away by car. There are many shops in Praia D'Oura itself. Alternatively, the older part of Albufeira is ideal to get a taste of the past with its narrow streets, handcraft shops and traditional Algarve colours. There are wide shopping streets and a lively atmosphere, particularly in the large square, where live music features at times. There is a local market every Tuesday between Praia D'Oura and the old town of Albufeira. There are many bars and restaurants in the locality. Praia D'Oura is perfect for anyone wanting lots to do and a lively atmosphere! The Strip has everything you need, with all manner of cafes, bars, restaurants and clubs to choose from. During the day, you can enjoy lunch at any one of the numerous cafes and restaurants, whilst at night Praia D'Oura really comes to life. Many of the bars and clubs offer a great atmosphere. They are open until the early hours in high season with a varied choice of live music. Alternatively, neighbouring, Albufeira also has a host of restaurants, serving a range of cuisines to suit all tastes. Praia D'Oura Beach at the bottom of the hill is around a 15 minute walk from Villa Elo. This golden sandy beach offers water sports facilities plus a choice of beachside cafes and restaurants. Alternatively, the beautiful and expansive sandy beach in Albufeira, flanked by dramatic cliffs and rock formations is a short drive away. For more relaxing surroundings, a string of picturesque cove beaches can be found just to the west of Albufeira, such as Coelho, Castelo and Gale. A little further afield, 15 minutes' drive on either side of Albufeira, are the sandy stretches of Praia Grande to the west and Falesia to the east. Zoomarine is an exotic marine life theme park home to hundreds of fantastic and fascinating sea creatures. There's also a choice of water slide parks all within a short drive. Chic Vilamoura, with its international marina, casino, shops and restaurants is well worth a visit for a day or evening out. For golfers, the 9 hole Sheraton Pine Cliffs course is nearby at Olhos de Agua, with four full courses about 25 minutes' drive away at stylish Vilamoura. Why not take a trip to Parque Aventura, situated in Santa Eulalia, Albufeira, comprising of a paintball centre and various adventure courses through the trees made up of zip wires, bridges and ropes? 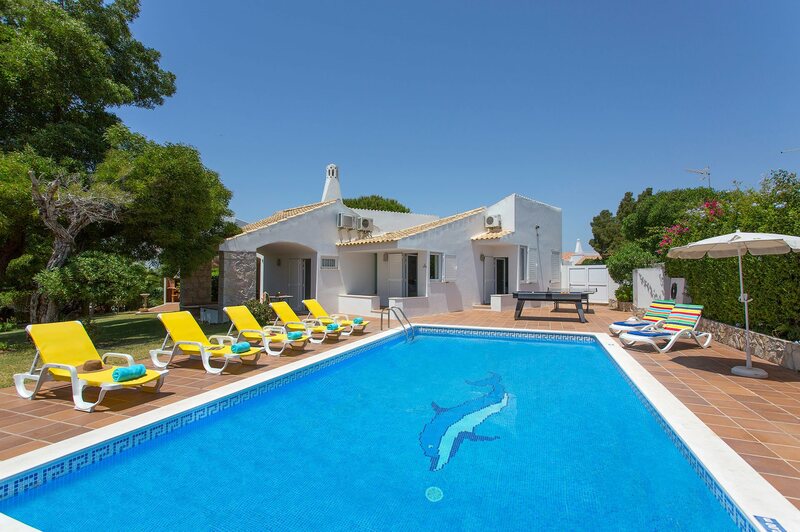 Villa Elo is not available to book for 2019 season as it is sold out. Take a look here at the Algarve villas that are currently on sale. We stay at this villa twice a year and is perfect in every way. The cleanliness of the villa is excellent and the pool is cleaned twice a week. Overall our holidays with Villa Plus are always stress free and relaxing and that's why we always return. The villa was excellent and we would (and have) highly recommend this to others! Brilliant Villa near shops, bars and "the strip". Praise should be given to the maid service and pool maintenance man as they work very hard and are always friendly. We return here year after year. Nothing to suggest as our family thoroughly enjoyed our holiday and the villa met all our requirements.